PORT-AU-PRINCE, Haiti -- At least 20 people on a music group's packed Carnival float in the Haitian capital were killed Tuesday when they were electrocuted by a power line, officials said. 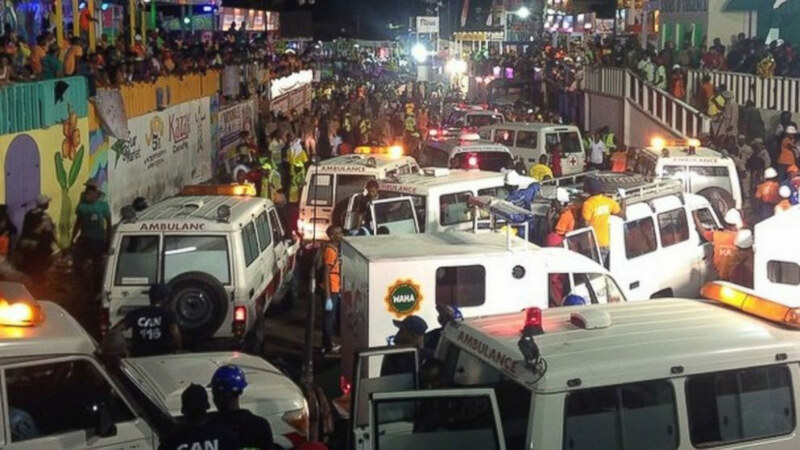 The accident occurred as thousands of people filled the streets of downtown Port-au-Prince for the raucous annual celebration. People at the scene said someone on the float used a pole or stick to move a power line so the float could pass under it. At least 20 people were killed and 46 were injured, according to Nadia Lochard, a coordinator for the Department of Civil Protection. The float was sponsored by the Haitian hip-hop group Barikad Crew. Some of the victims were instantly electrocuted in a flash of sparks, according to witnesses. Others managed to jump off, causing panic in the crowd. "I saw the wire falling and sparks and I started running for my life," said Natacha Saint Fleur, a 22-year-old who was near the float at the time. Hundreds of people thronged the General Hospital, where many of the victims were taken, some carrying victims and others searching for family members brought by ambulance.